← Fashion over 40: Catwalk or Tightrope? The Summer of 2013 will hereafter be known in our household as The Summer Stormy Got Her Boat. KitKat and I live in the Land of 10,000 Lakes, and it’s part of the local culture to have a cabin and a boat. I grew up with this reality. My parents bought their first cabin when I was very small and bought another one when I was a teenager. On the other hand, my husband—despite being a native Minnesotan—was raised like an Iowa Farm Boy. He never wore shorts as a kid. And if he or his siblings serendipitously found themselves near a lake, they were allowed to roll up their pant legs and wade along the shore, but that was the extent of any beach activity. Fast forward to 2008, when we purchased our own “cabin” (that’s a topic for another post) in a beautiful river town. Surely a boat was in my future. 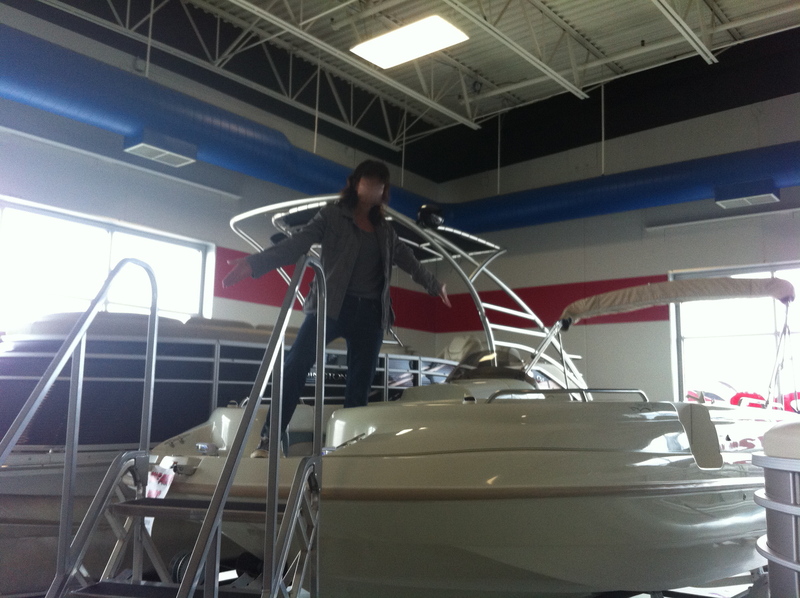 With active teenagers, I knew we’d never have enough time on the water to justify a boat, so we settled for renting a pontoon a couple of times each summer. 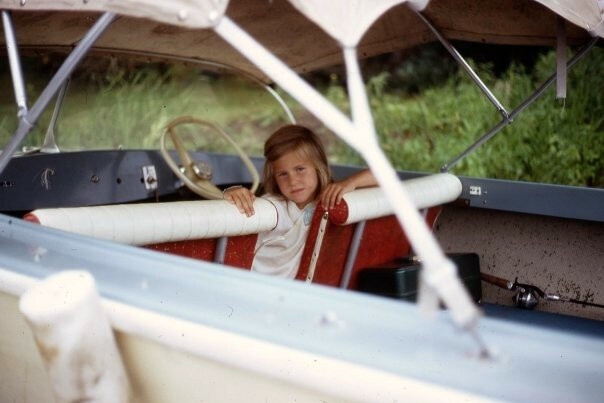 But this spring, as we were gearing up for our youngest child’s graduation from high school, I got a bad case of boat fever. My ever-tolerant husband accepted that the metaphorical vessel was leaving the dock, and he had no choice but to climb aboard…and so he did. I researched options with other watercraft owners and sifted through a boatload of advice. A friend helped me narrow my choices and I spent Mother’s Day weekend checking out local used boats for sale—after three days of intense shopping, we found it in a showroom an hour north: A used deckboat in great condition with a 250 hp motor. First, we needed to gear up. Life jackets, ropes, bumpers and a new rolling cooler were on the list. Memorial Day weekend provided our first opportunity to take the boat out. Cold and windy, it was lousy boating weather. But we were two weeks into a 30-day warranty and I wanted to make sure the engine ran. So we embarked on our maiden voyage. The first step was getting out of the marina. Surrounded by large, expensive boats, this was a daunting task. Did I mention that it was cold and windy? Wind + river current + novice driver + other people’s yachts = a very stressed Stormy! I decided to let my husband navigate out of the marina, while I wielded an oar for the purpose of pushing away from any boats toward which we might drift too perilously close. 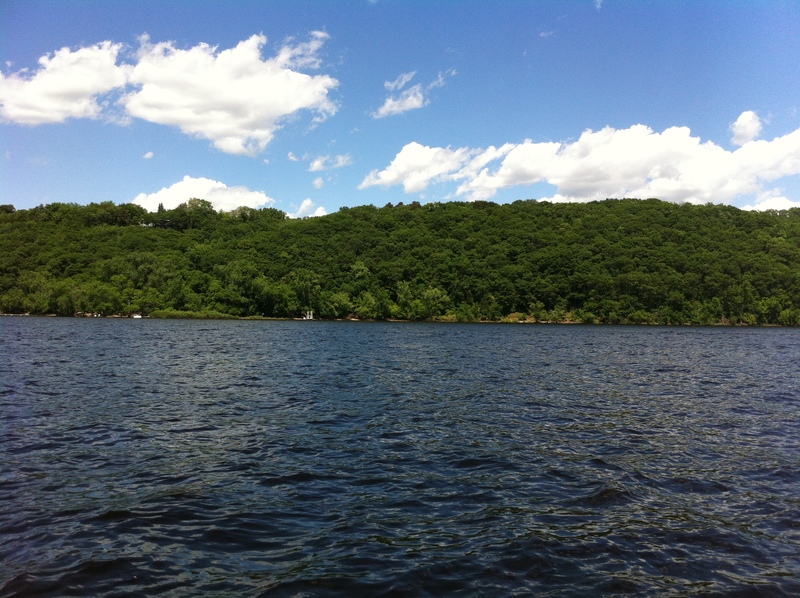 Out on the river, I relaxed a little and we were able to confirm that everything ran properly. After a short excursion, we headed back to shore. My husband’s Parkinson’s meds had worn off, so I rose to the challenge of returning to the marina and took the helm. I had to drive faster than I wanted just to counteract the wind and the current, but I still found myself drifting uncomfortably close to much more expensive vessels. I quickly panicked and the only nautical skill I displayed was my ability to swear like a sailor. Fortunately, my gallant husband swooped in to rescue me. Even though, his meds weren’t working, the adrenaline surge caused by his wife’s distress compensated for the lack of dopamine until he flawlessly brought us to safe harbor—all neighboring boats unscathed. After that initial excursion, a late spring and my daughter’s graduation kept us off the water until mid-June, but we spent the rest of the summer trying to make the most of our new purchase. Looking back on the season, I’ve learned several things about boating. B-O-A-T stands for Bring On Another Thousand – My brother taught me that one, and based on one season’s experience of paying for gear, accessories and repairs, it appears to be true. Rivers are trickier than lakes, and more fun – I had spent many summers boating on lakes, but boating on a busy river is a whole new ballgame. I love seeing all the other watercraft and their ports of origin—the St. Croix gets summer travelers from as far as the Gulf of Mexico—and people watching. I’ve also learned there are many hazards to navigate, as my propeller took a nasty hit when we ventured too close to a buoy and likely hit a wing dam. What’s a wing dam, you ask? Hah! Now you see my point! I like going fast – Anyone who has ridden in my car would guess this, but I looooove it when the river finally widens so I can open up the throttle and jump the wakes of larger boats. I’ve also learned that can coolers, life preservers, hats and mojitos all need to be secured, lest I inadvertently pollute my Wild and Scenic River. I will never get my money’s worth from this purchase… – There’s an old adage that the two happiest days in a boat owner’s life are the day they get the boat and the day they sell the boat. I’m sure this is based on the fact that boats are pricey toys and most people will never use theirs enough to get their money’s worth out of it. I can already see that will be true for us. Still, we got out on the river 7 or 8 times this summer, so that works out to…what…still more than $2k per outing!? At that rate, it’ll take us quite a while to make this a cost-effective recreational investment. …yet I don’t regret it – This is perhaps the biggest surprise of all. I thought that after wanting a boat for so long, I’d become bored with one once I got it. 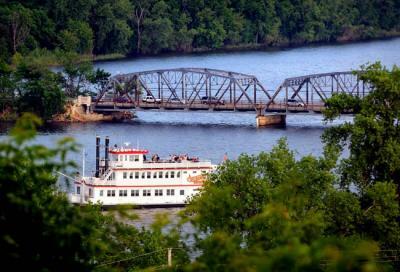 But on a sunny summer day, there’s no place I’d rather be than on the river. While I’m still very much a novice, my driving has improved a lot in one summer and learning a new skill has been good for my psyche. Most importantly, I’m learning that life—like boating—is easier when you learn to go with the flow. This entry was posted in Attitude, Hobbies, Money, Random and tagged boat, river. Bookmark the permalink.